To Hang On or Let Go? There is an end-of-Camino ritual at Finisterre, to burn something from the trip (or toss it into the sea). The symbolism is personal: for some, it could be a form of spiritual completion, a break with the past and/or the promise of a new beginning. A few days before arriving to the coast, I walked with another Italian who mentioned he’d toss his whole backpack into the flames except that he still needed it to continue his trip. I laughed. Wouldn’t it be cathartic to turn it all to ash? I told him I wanted to burn my hiking pants. The hems were muddy and torn, the fabric and fit unflattering. I had bought them years before because they were on sale. Every time I wore them I hated how they felt. They were even noisy: the pants legs rubbed together and made a swishing sound. I couldn’t wait to get rid of them. Indeed, when I settled in at the albergue in Finisterre early in the afternoon, I told several people how excited I was about burning my pants. And one of them, a (male) German cyclist with hair as long and golden as Rapunzel’s, talked me out of it: not only would setting polyester on fire pollute the air, but someone else would be thrilled to have them. Instead, as I walked the final 3.5 kilometers to the Finisterre lighthouse before sunset, I brought an orange tie-dyed handkerchief. I dislike tie-dye, but I had wanted something bright to loop to my pack to be visible to hunters. Indeed, I had bought it at the last minute out of fear of sudden death or injury. Maybe I could incinerate that fear along with the kerchief. At the lighthouse, blackened boulders, residues of rites past, dotted the craggy outcropping. Thick clouds threatened to rain on the ritual. Soon after I got settled, someone else started a small fire so I dropped my cotton square into it. Within seconds, the flames silently devoured it. A few days ago, here in Massachusetts, I peeked into my mother’s attic which, over the years, has been a repository for a revolving inventory of my stuff. I hadn’t been up there in a long time and I didn’t remember what, exactly, it still housed. I thought there might be just a few boxes which, after the Camino, I wouldn’t even want anymore. 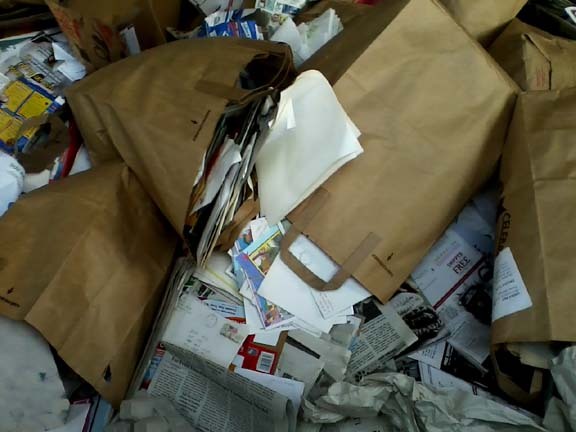 Instead, I was confronted with bin after bin of old letters, photos, artwork, stuffed animals, school notebooks and childhood craft projects, the survivors of previous declutterings. While I am no longer the young girl who saved every relic of her life as if it were sacred, a wholesale purge of the attic felt precipitous, a betrayal of my earlier self if not an outright erasure. Still, I was aware that, heaven forbid, had the attic been damaged by fire, I would not have known exactly what was lost and I wouldn’t have missed it. Life would have gone on and I would have fewer objects to dust, fewer papers to file, fewer photos to classify. If the Camino has taught me anything, it’s to live lightly, keep moving and don’t look back (unless it’s to admire the sunrise). It’s difficult to inhabit the present if one is burdened by a (backpack of) fear, nostalgia or blind loyalty to who we were yesterday, last year, or a decade ago. While it was easy enough to deliver a cardboard box of stuffed animals to my youngest nephew and niece, a win-win scenario, and throw out all duplicate photographs from the double-prints-are-free-era, making other choices has been more fraught. And I feel choices must be made because, like on the Camino, I’d like to have my belongings with me, know exactly what, and where, they are. When divided among storage units and attics, it’s as if my psyche and memory are themselves split. It’s frustrating to recall a beloved object or photograph and not be able to locate it. Right now, I have the time and space to sort and organize, and a borrowed car for trips to the dump. And, having lived with only a backpack for six weeks, I’m extremely conscious of weight. Letters — perhaps thousands of them — start to add up. Several of these, some from people whose names I barely recognized, I tossed into recycling bags or into the dancing yellow flames in my younger brother’s stone fireplace where they vanished with a satisfying hiss and roar. So far, I’m keeping everything from a few longtime friends and family members. But it’s possible that, if the volume remains overwhelming, I’ll have to pare the pile further. For example, do I need to save every birthday card I’ve ever received? Then there are yearbooks, from school and summer camp, which are also heavy. For the summer camp books, I tore out the pages with my bunk’s photograph and trashed the rest. Still pondering if my high school yearbooks are worth the cost of shipping. Some of my childhood artwork, too stained and mildewed to save, I’ve photographed. For other things, I’m trying to be disciplined, remembering that on the Camino, you can get by with just two of everything (pants, t-shirts, socks, underwear). Can I curate my belongings so that I’m only carrying a few representative objects? The answer is probably yes, even though it feels like a tiny death each time I discard an item. Just as on the Camino, I’m exhausted at the end of the day, even though I’m chipping away at pounds of artifacts rather than pounding out the kilometers. The payoff, I hope, is that I’ll feel lighter and freer, much as I did when I took off my backpack for the last time. Live lightly. Something to think about. Beautifully written. I struggle with memories that live in objects also, and I like your take on it. Thanks, Pam. I guess I wonder who I’d be if, for some reason, all of my mementos vanished. Would I feel free? Empty? Both? Hmm!